If you wonder what happened to the link I provided to my website blog, well, I had a bit of a nightmare. I still won't be able to use Blogger with my iPad, so I opened and migrated all posts into this new site below. I hope this is for the last time! Hopefully this will work across Africa! Only 2 months before departure! 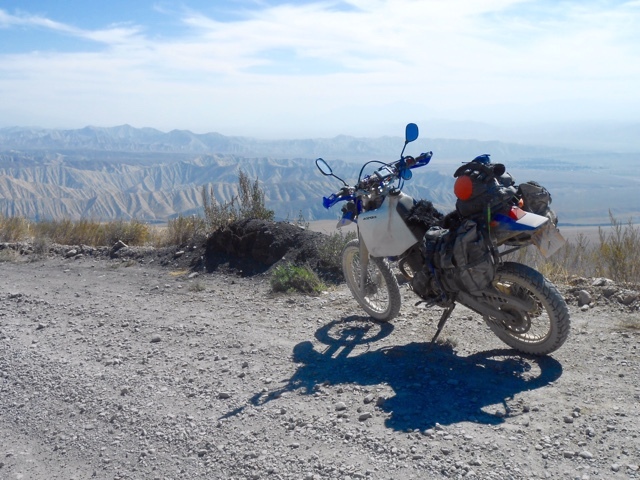 As some of you know, we are off on another motorcycle adventure later this year. This time to Africa. It is going to be epic! Because of the stupidity of Google with regard to Apple products I have to move the blog to a new platform. You can also find it through my main website. 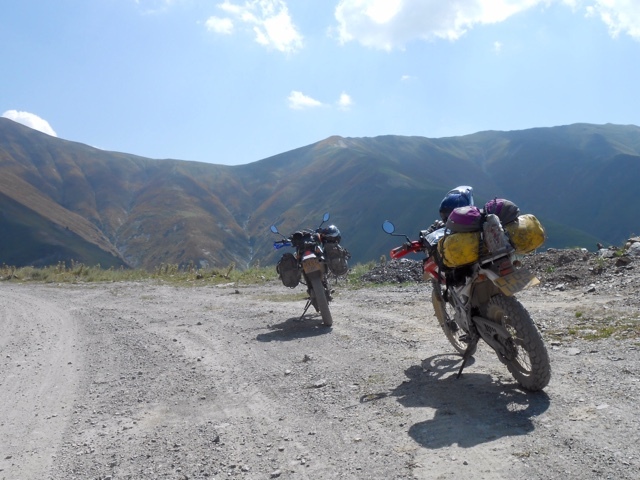 From Kochkor we rode to Bishkek. The road was rather busy and we crossed many buses full fo people going to the Nomad World Games. 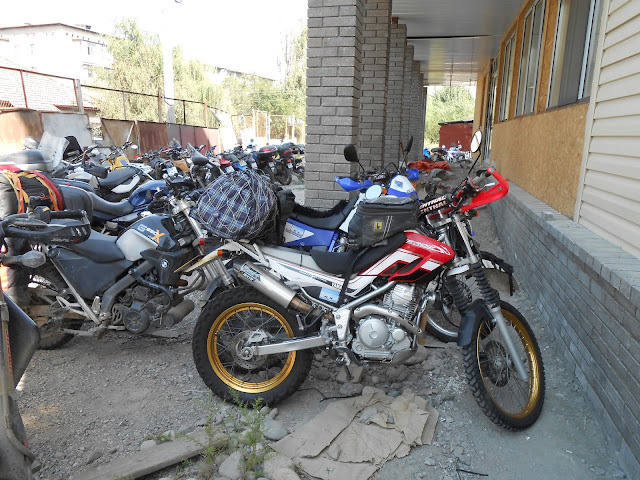 These were going to start soon, in a small town by the shore of nearby Lake Issik Kul. 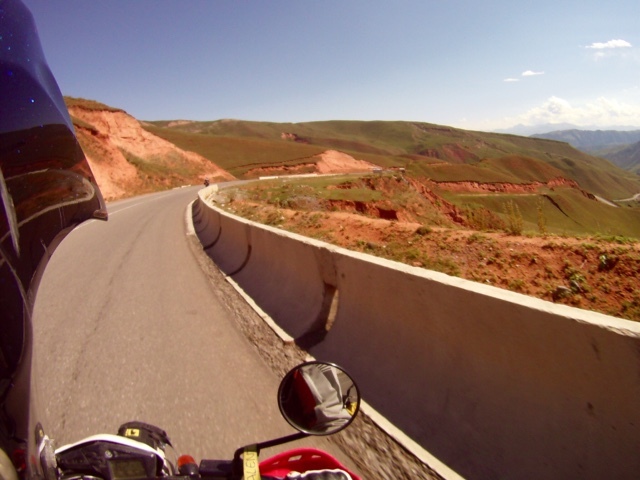 We got to Bishkek and rode to Hotel Rich. The following few days we repacked everything and delivered the bikes and luggage to the compound, ready to be tucked back to Europe. The compound was full of bikes form everywhere in Europe! 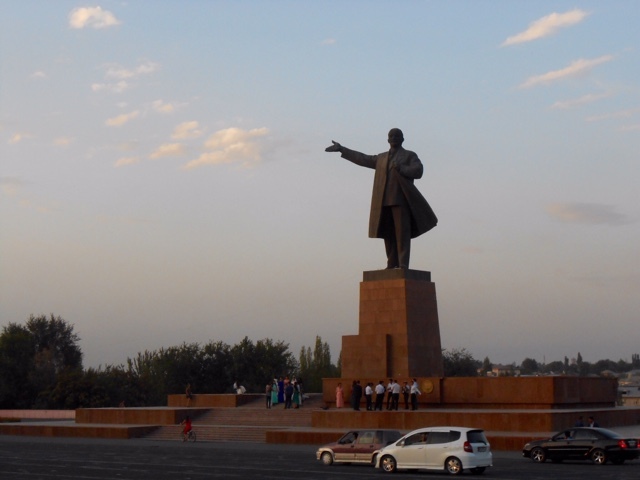 We then had few days left in Bishkek, and got bored very quickly! 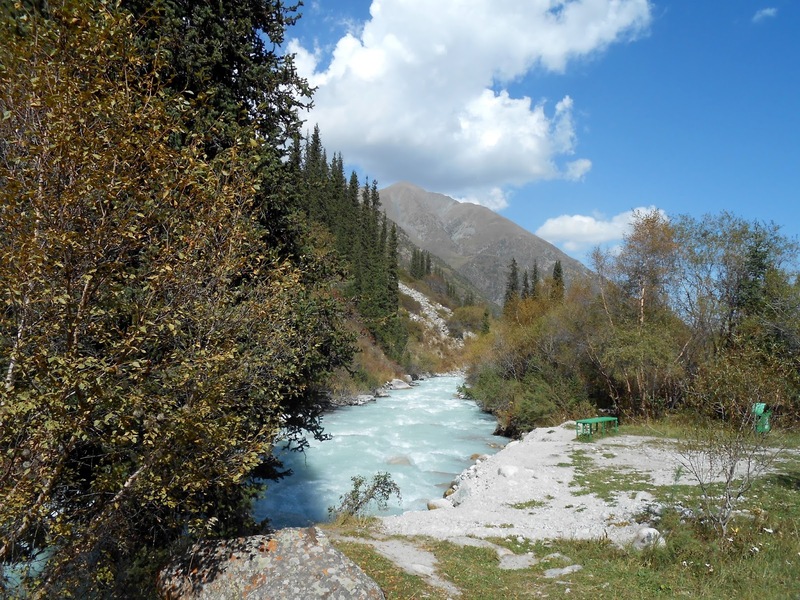 We decided to rent a car for a couple of days and visit a Ala Archa national Park. 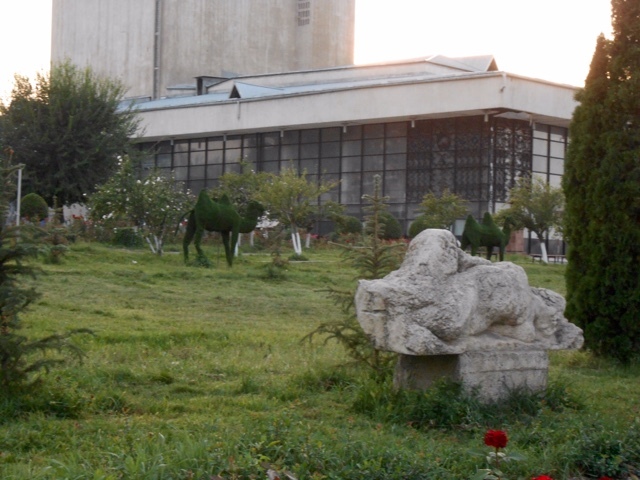 We also visited a derelict and very soviet style sanatarium. It was then time to go home. 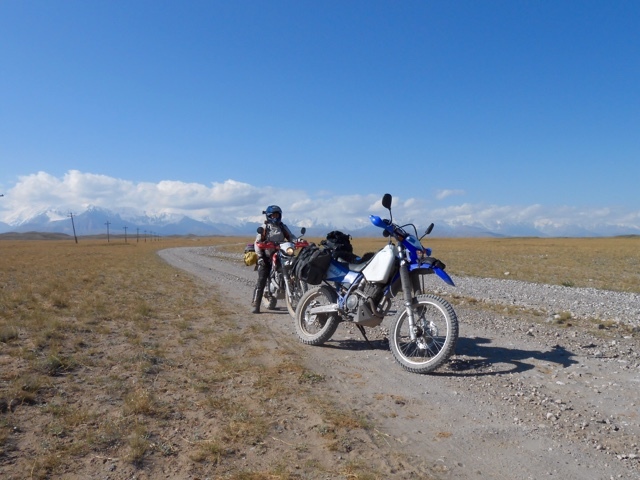 In total we covered 15,000 kilometres, had no punctures and no major issues with the bikes. Thank you for reading my blog. 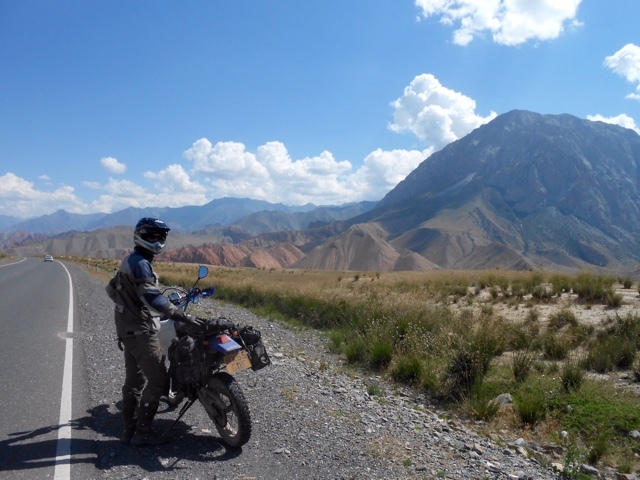 I hope you enjoyed our adventures across Russia and Central Asia and that it will inspire you to visit some of those beautiful places. Finally we left Osh for the last time. We had spend way too much time in Osh two years ago, and this time again! 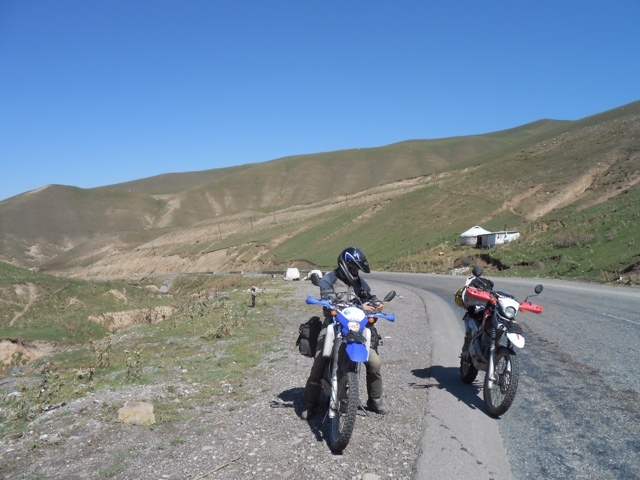 We first took the main road to Jalal-Abad, although, as usual, the GPS took us through some shortcuts of its own! The shortcut ended in a near dead end. 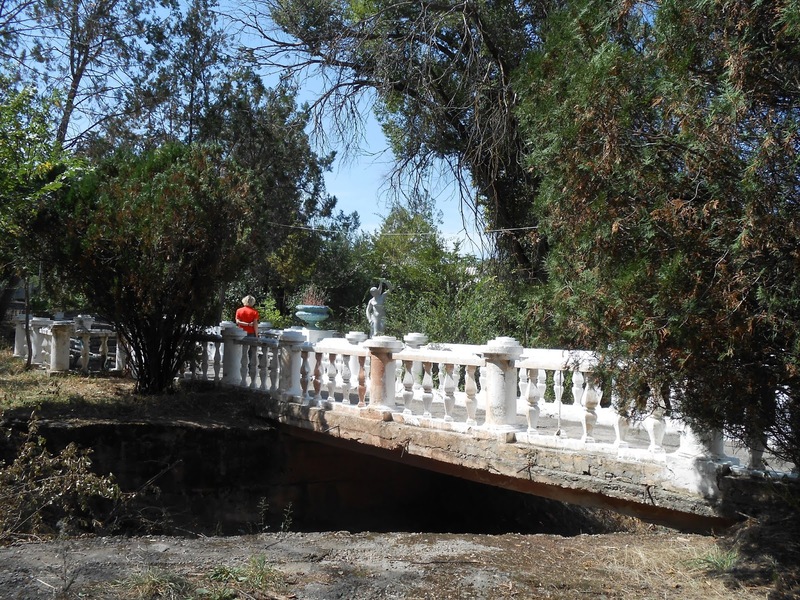 This bridge had collapsed and was closed to traffic. After further inspection we decided that it was solid enough for our light motorbikes. Alistair went first (he is the heaviest!) and I Followed quickly! 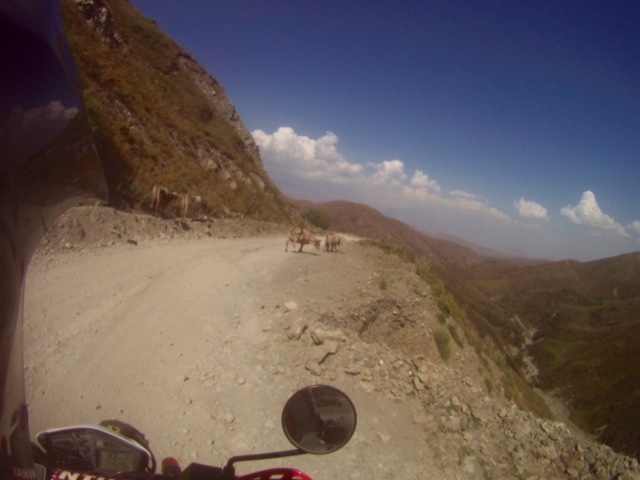 Then, in Jalal-Abad, the GPS tried to take us through the wrong track. 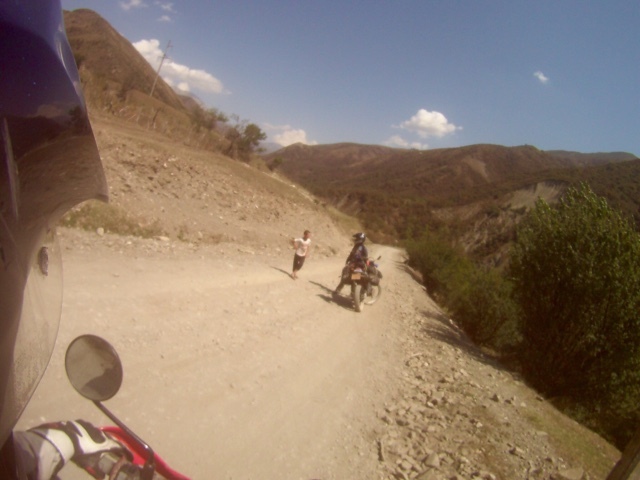 Fortunately, as we hesitated, an old man told us how to pick up the correct road to Kazarman. Once on track we left town. 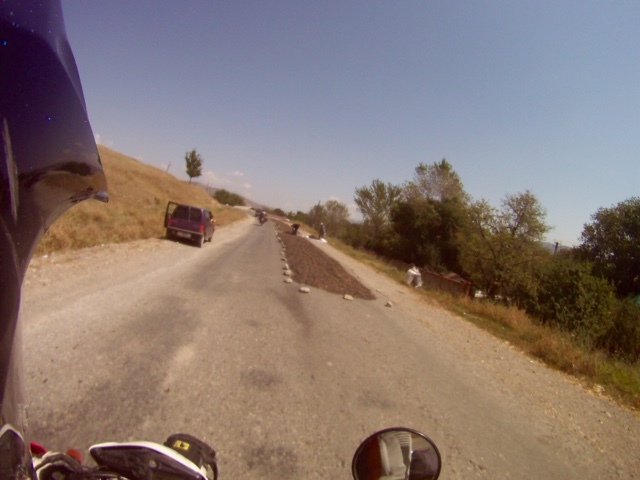 The road out of town had new Tarmac, and the locals seemed to use half the width of that road to dry sunflower seeds. Finally the Tarmac ended. The road was also less busy and we were able to relax a bit. 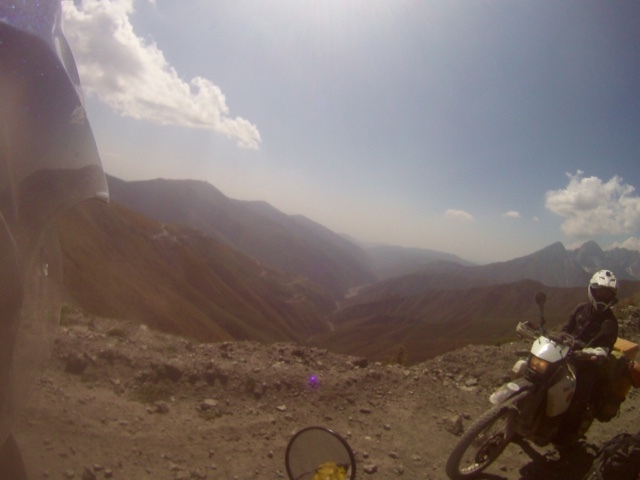 We started climbing into the mountains. The region is very dry. We didn't really cross any villages of significance during the day, few farmers here and there. One guy was guiding his cows by the side of the road. His very large and very aggressive dog ran after Alistair and then tried to get me, his teeth just inches from my legs. I stopped and gave a superb mouthful to the farmer who found it funny. Moron! I wish I could have been able to taser his rabid dangerously aggressive dog. I am losing patience with dogs and crazy drivers now. I tend to give them my opinion using a very colourful language! 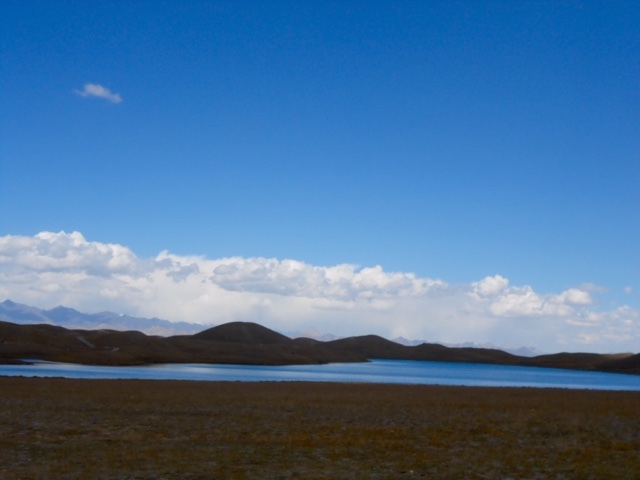 Eventually, in the evening, we arrived at Kazarman. 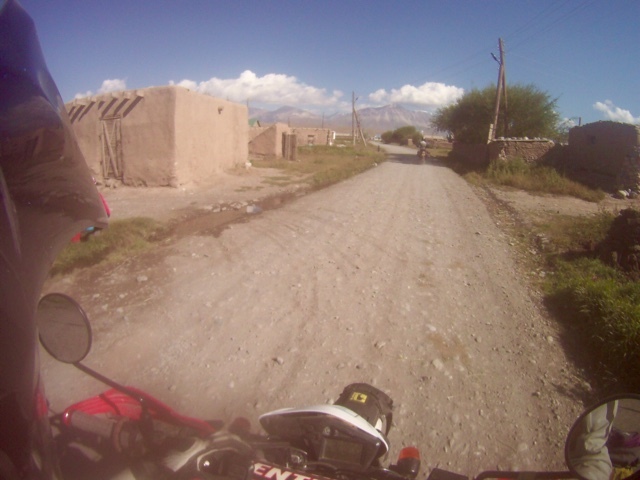 My guide described the town as a poor, dusty bowl settlement with a reputation as a tough mining town, down on its luck. That's one way of describing it. I could think of other terms, but would be less flattering! Oops! The GPS took us to a Bed and Breakfast. Well... It is how it was called. The place was a bit under construction. It had no running water so the toilet was the usual hole in the ground in the back of the courtyard, and they had a sort of shower: a plastic hut with a big bowl of water on top! After taking a look at the kitchen, we decided we would not have any dinner or food at the place. 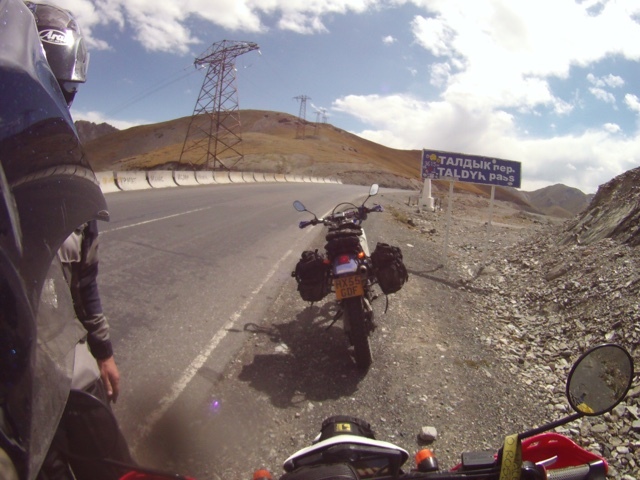 After our adventure in Osh we have decided to stick to processed food or biscuits, in places without running water! So we went in search of a shop. We found few. Each was so small it hardly had any food at all. One had two boxes of pot noodles left. After closer inspection, the expiry date was still to come. Once again, we have learned our lesson the very hard way about checking expiry dates! 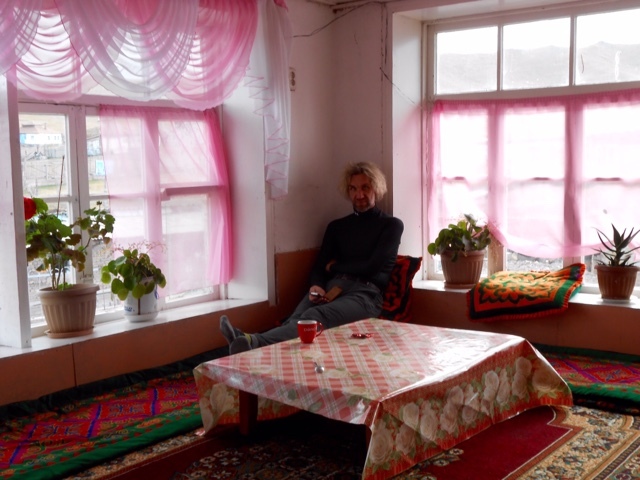 Back at the guesthouse, we sat inside the yurt that was used as a dining room. We asked for boiling water. The look of disapproval on the middle aged woman running the place was a story in itself! I shrugged, I did not fancy a trip to the hospital. The dining room had small jars of jam, uncovered, sugar, bread and others foods in one table. And lots of flies around making the most of it! Nice! I have observed food covered in flies often enough to convinced me not to touch anything! Best to be avoided! We ate our chemical pot noodles. As there was nothing much to do, we had an early night and asked for breakfast at 7:30. I was up and around very early. We packed everything and we were ready for breakfast at 7:30. We asked for green tea only but yesterday's bowl of bread and croissants were still there. The woman also brought some butter covered with sugar and unidentified stuff. Happy flies! After having our tea, we were ready to go. There are places, no matter how simple it is, you feel at ease. Some places are the opposite and you can not wait to leave. 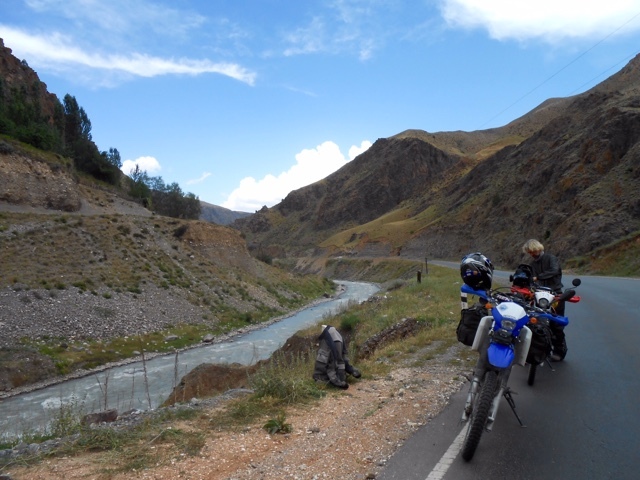 That place was one of those were I just want noted to get back on the road as quickly as possible! 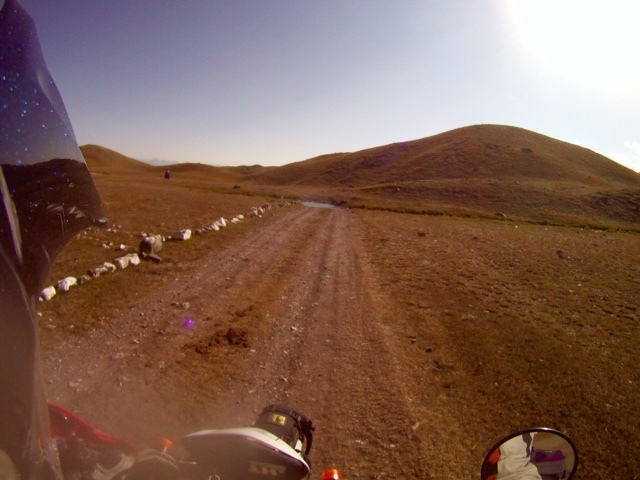 The first 80 kms out of Kazarman, we rode a very bad gravel road. 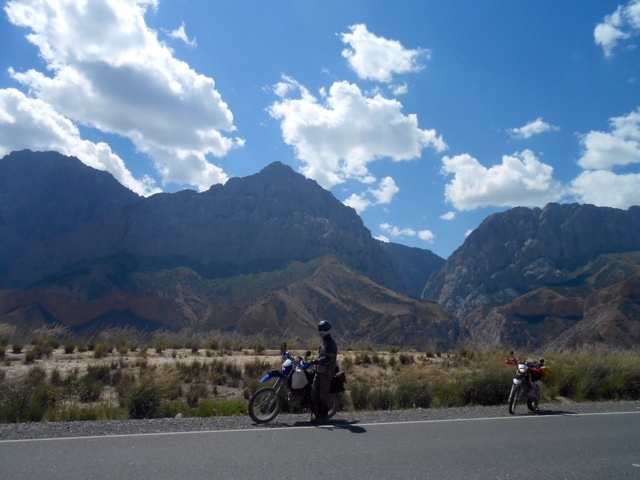 It was also very busy as it joined to the main road to Naryn. 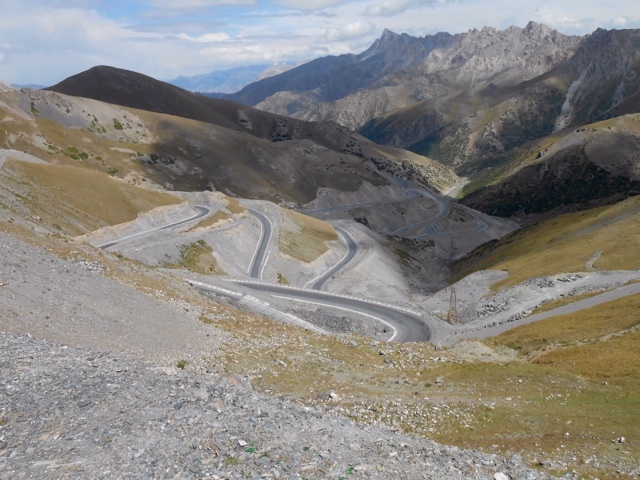 Eventually we took the turn toward the Moldo Ashuu pass.... No one but tourists would use it. We stopped at the turn off, near a derelict bus station, to have a drink and eat few peanuts. 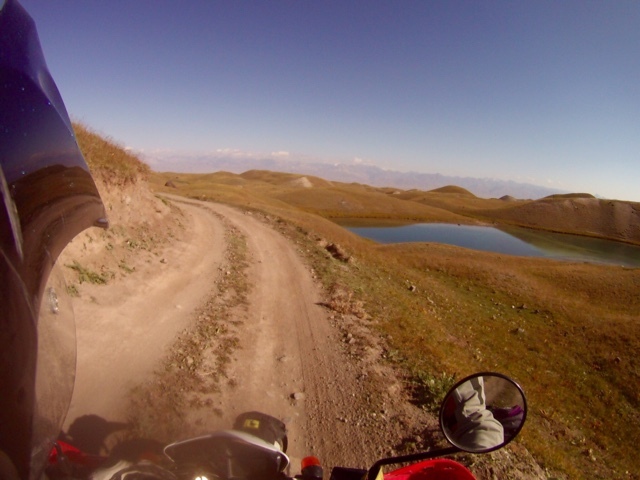 Then it was time to negotiate the stunning pass. We met some cyclists on the way and we had a good chat with them. They were on a 3 years tour! 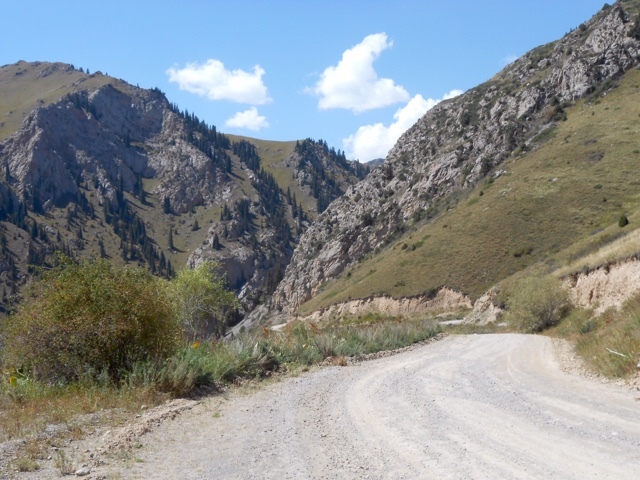 The climb to the pass was spectacular. Shame we don't have good pictures of it! 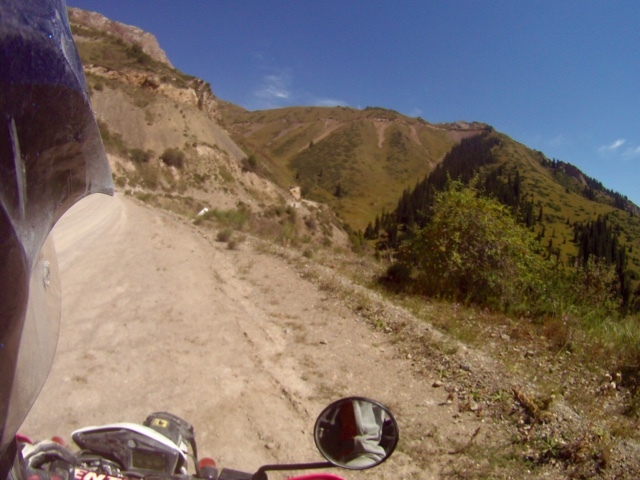 From the pass, we followed the gravel road to the Song Kul lake, another major tourist point. 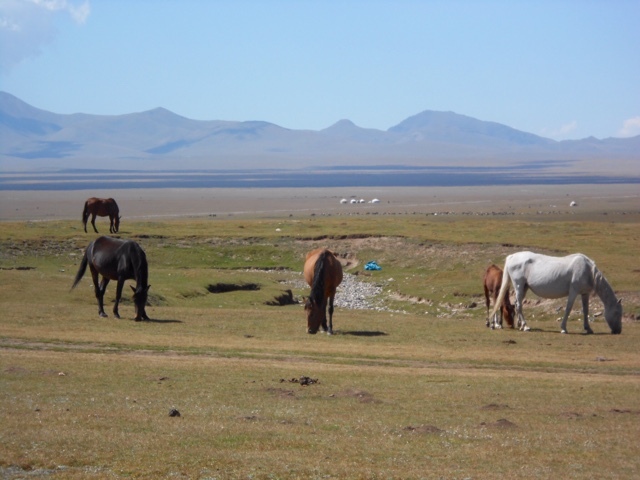 It is set at 3000 m altitude, and with the many yurt settlements and animals roaming free, it is a bit picture perfect! The road went along the lake and through another pass. 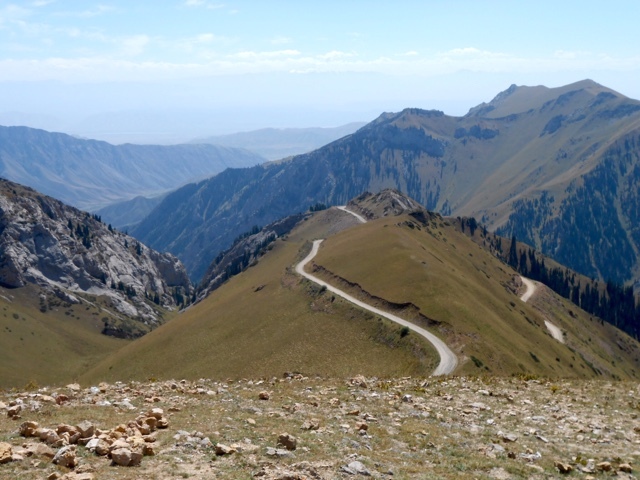 We finally picked the main road to Bishkek. 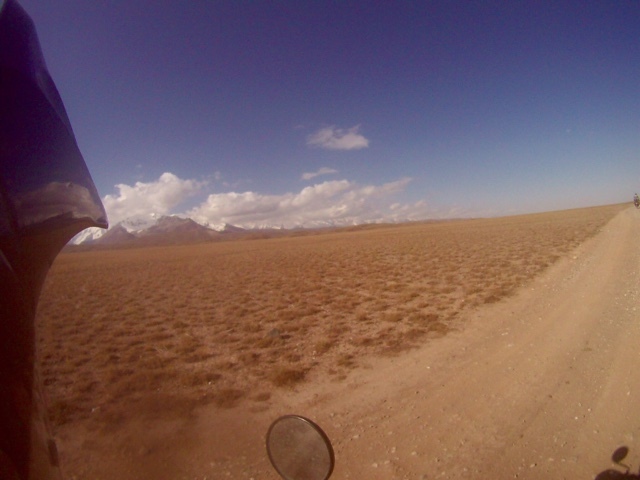 We arrived in Kochkor by late afternoon. We rode straight to the hotel Adamkaliy. 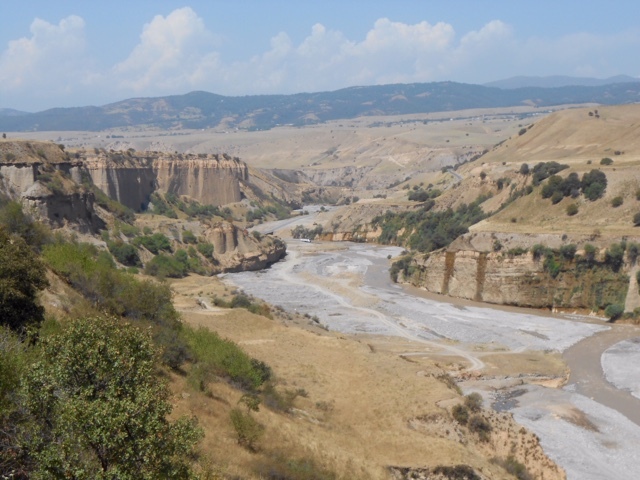 We had been staying there one night, three weeks ago, on our way to Naryn. We had liked the place and the family was welcoming and friendly. The place was empty this time so we took a room with private bathroom! Luxury! It is funny how perception can change. 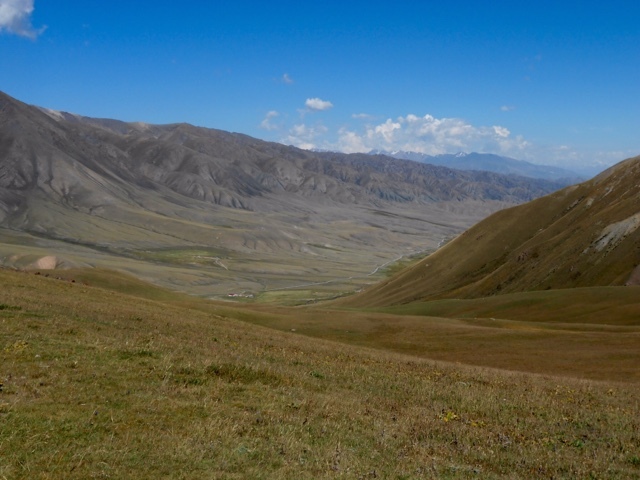 After so much time in little places, Kochkor seemed almost like the height of civilisation! It had a mini market that actually had stuff you wanted to buy, and aisles, so you can pick your stuff yourself , rather than ask someone over the counter and pointing ; it had a touristic cafe with a menu in English and food that would not cause too much problems to our stomach.... Civilisation! More drama before it gets better! By 3am that morning, Alistair woke up rather sick with food poisoning. At 6am ! He was feeling so bad, I went down, to the hotel reception to get a doctor. Soon after, two medics arrived and gave him an injection after checking him. One of the hotel staff was helping with translation. At 7:30 / 8am, Alistair got much worse and was having severe abdominal pain. I walked to reception again and asked them to help as we needed to go to hospital. It was a different crew at reception. They called an ambulance. Traffic was bad at that time and it took some time to arrive. Alistair was then examined by the paramedics in the couch of the hotel reception! The verdict was that he had to go to hospital. 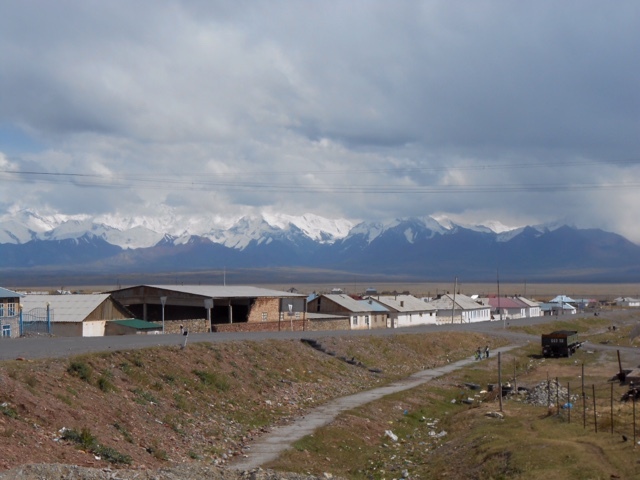 A common occurance in Kyrgyzstan. One week earlier, our friend Howard was also taken to hospital, for food poisoning, and put on a drip! 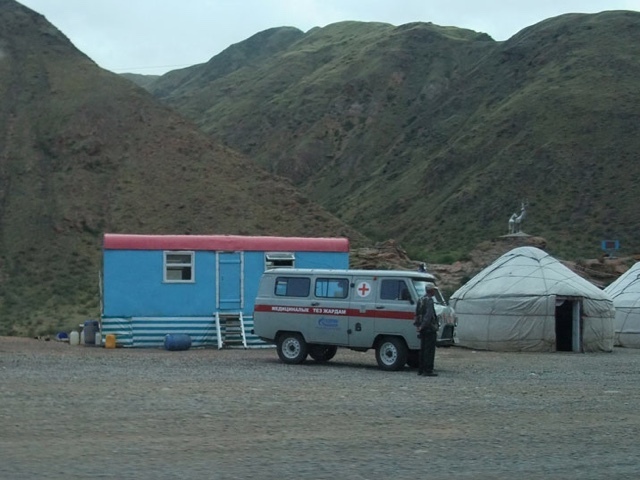 The ambulance was UAZ 4 wheels drive, with rustic engine and nothing much inside to lay down. It stank of diesel inside, but did the job. Photo taken from a Russian site on the Internet! One of the receptionists at the hotel, came with us, as we needed help with translation. Not many people speak English around here! That was very kind of the staff. At the hospital, we were taken to a consultation room, where a doctor was already working with a patient! We waited a bit and he examined Alistair. He was then taken upstairs where I was not allowed to follow! What happened then is what he described to me later. Basically he had his stomach washed in the inside, in a rather crude but effective way! He was given a lot of warm water to drink, then had to make himself throw up in a bucket, by inserting his fingers down his throat, while Erlan , the hotel receptionist, was holding his head! After being repeatedly made to do so, he was then taken to a small room that had three small beds. The doctor then gave us a piece of paper with a list of stuff to buy. Erlan took me to one of the many pharmacies in site, and we came back with two bottles to be used as a drip, and lots of old fashioned ampoules containing different liquids ( no idea what it was!). After handing the goods to the nurse we had a long wait, as Alistair was left with a drip and had some sleep. We came several times, but he was sleeping and we were told to wait as Alistair had a bit of fever, so could not be released. 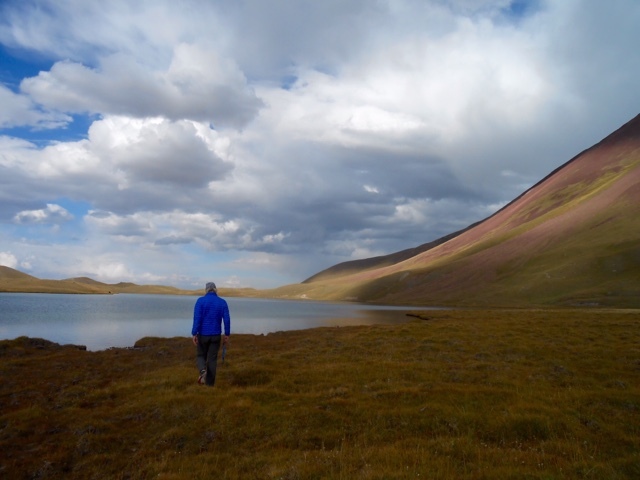 We had a long time, with Erlan, to wander around and wait. He told me how, the previous week, he spent all day at the police station, helping two British citizens saying at the hotel. They were part of the Mongol Rally and had decorated their car with horns from the Marco Polo sheep. 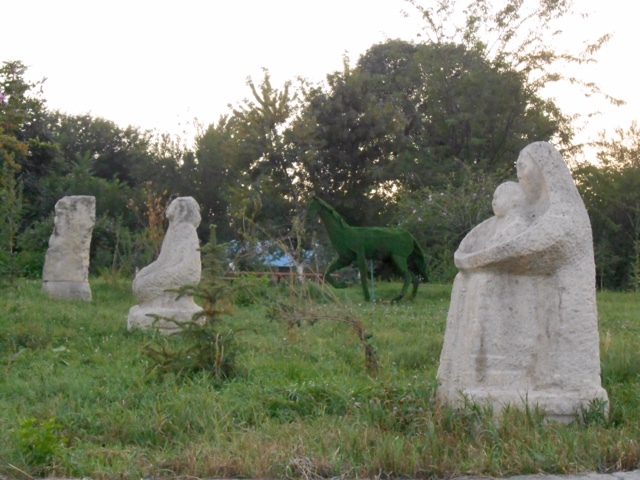 They said they found the horns by the side of the road! Unfortunately, the Marco Polo sheep is an endangered species, and being found with the horns is illegal and was big trouble. They were told by the police and the special police in charge of these cases that the fine was of half million Soms ( about 8000 dollars !). Eventually, pleading ignorance (or stupidity?) and with the help of Erlan and one of his friends, the Brits got away with much less. Eventually, by early afternoon, the doctor announced that Alistair was good to go! Price of all that? About 2 pounds for the pharmacy, and about 6 pounds for the doctor! We went back to the hotel and I bought some green tea and sugar to settle his raw stomach. He was feeling much better. Now , what caused such bad reaction? We suspect the meal at the yurt camp, near Sari Mogul, was the culprit. No hygiene, dreadful tasting, smelling and looking meal.... Those "home stay " can be seriously bad as far as food is concerned! We decided to stay an extra day, to give Alistair a chance to rest. Late morning we rode the bikes to Patrick's place to pick up our camping gear. The place was shut and no one around. We went back and phoned Patrick. Alistair went back later when Kolya, the Russian mechanic, was there. We then repacked everything. We did not do much else. 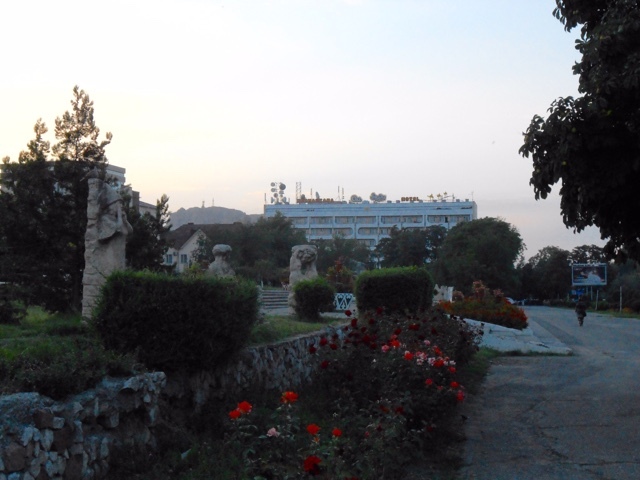 I took few pictures of the area, and of hotel Osh Nuru. We can't thank the staff enough, and Erlan of course, for their constant help! Top place to stay! And nice breakfast! Lenine of course! Everywhere! 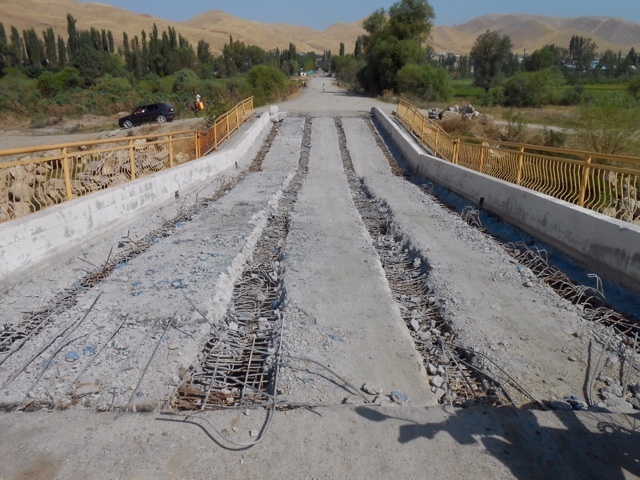 In Osh this time! And of course, the Osh Nuru. A big soviet style building but nice inside! That's all for now. Don't miss the next chapter ( tomorrow) with the most beautiful photos of this trip! 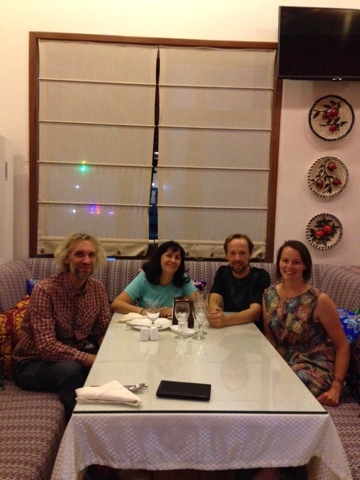 The night before, we received an email from our friends Anna and Howard. 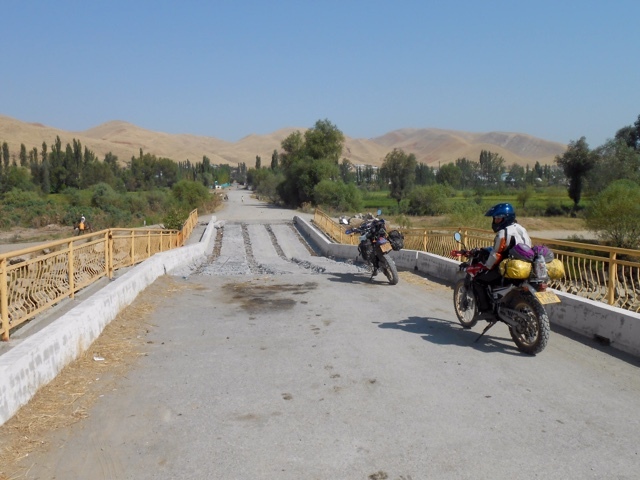 When we left them the night before, they were planning to leave Osh friday morning... Howard, who had been suffering from an upset stomach since leaving Tajikistan, got worse overnight and had to go to hospital. He was put on a drip and given antibiotics. 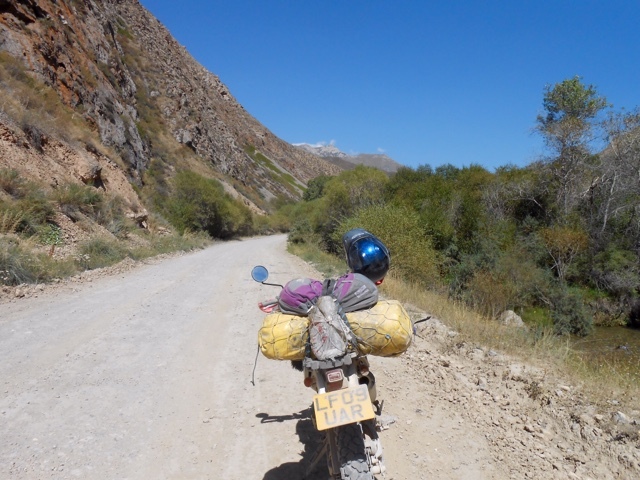 He had caught some parasite while in the Pamir. 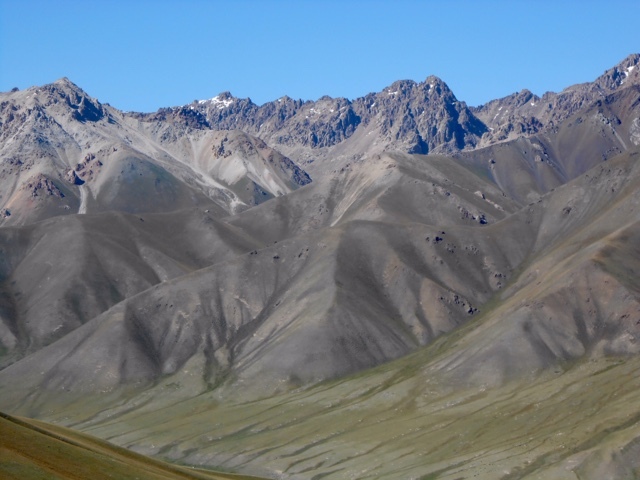 That left us more determined to be careful with the food in the Pamir, and we bought some dried fruits and nuts, few tins of Paté and biscuits. That would help us keep going if guest houses meals were looking not too good! 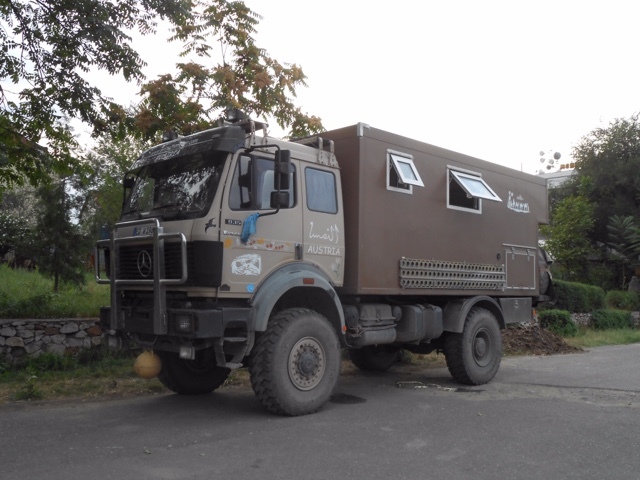 Massive overland truck in Osh. We left Osh soon after 9:30. It was slow going, as usual. 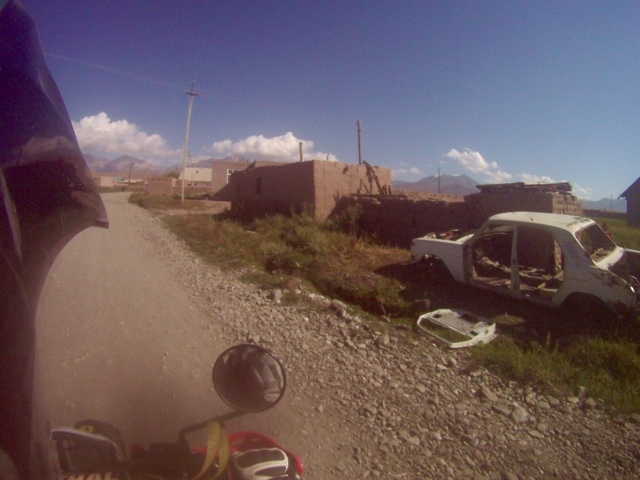 We took our time as we only had 185 kms to the village of Sary Tash. 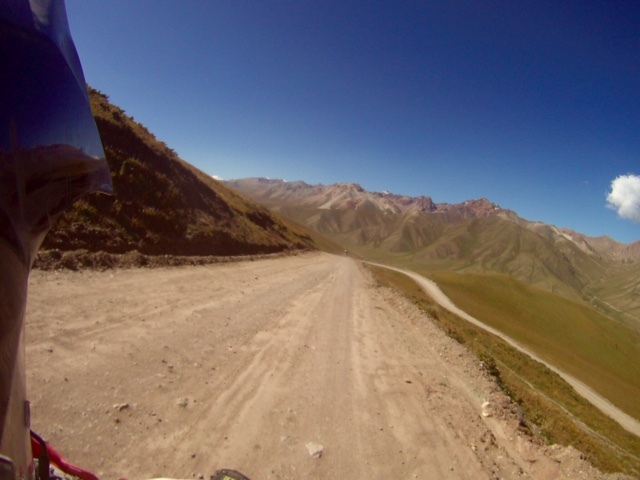 Going from 1000 m to 3000 m altitude, was enough and we needed to spend one night at 3000m before going higher. 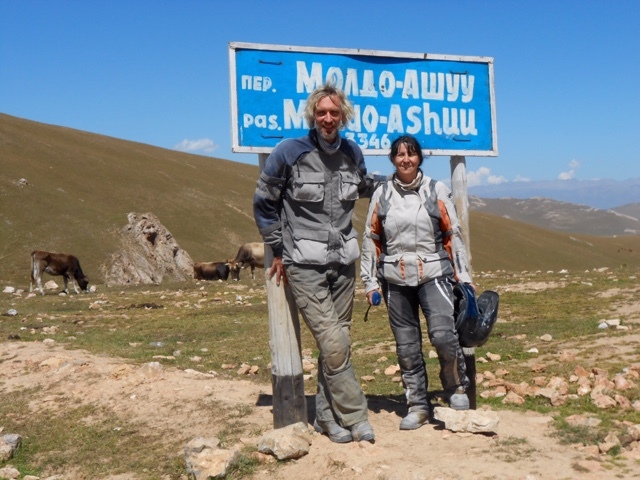 On the way we met a couple from Estonia, on two DRZ400. They were having lunch at a cafe, so we stopped for tea with them. 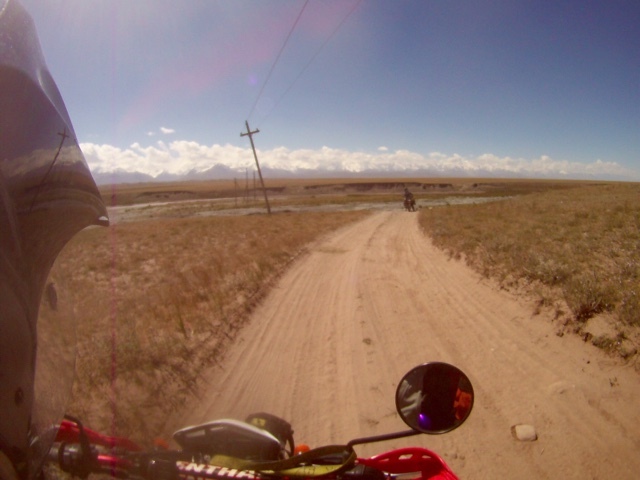 As we were leaving, a Mongol Rally car was stopped near our bikes. It was being pulled by a truck! 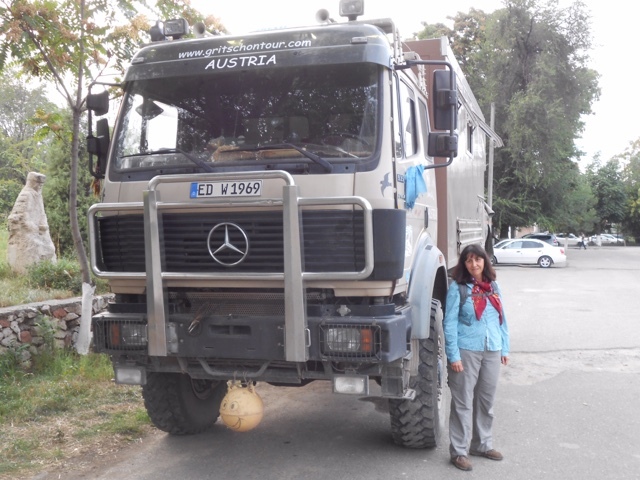 Not sure it will make it to Mongolia! 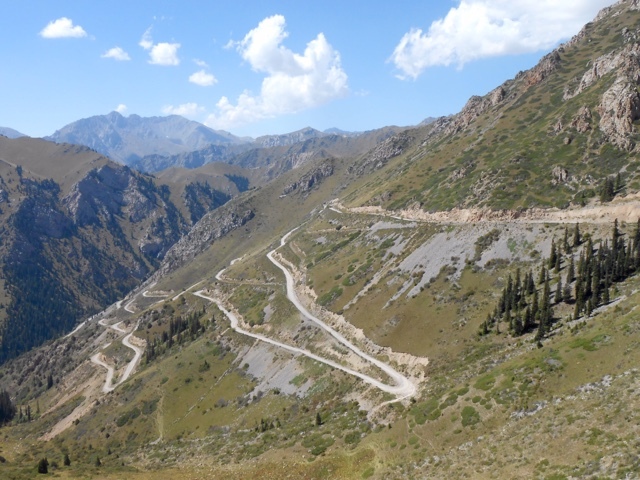 The road was very beautiful and taking us through few mountains passes. 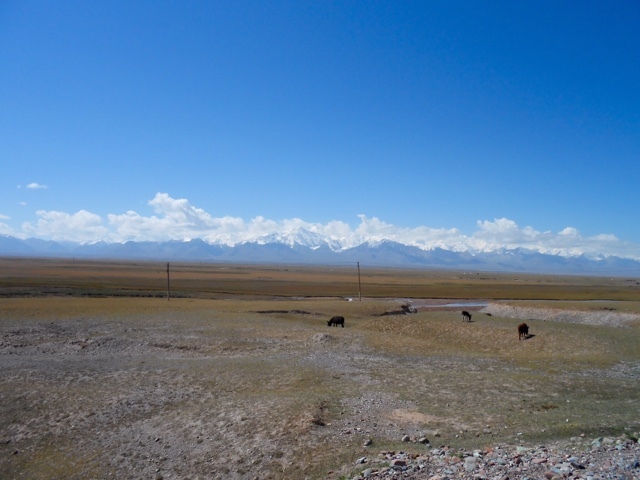 We arrived at Sary Tash by 3pm. We stopped at the same home stay than two years ago. There are few more guest houses now, but all are pretty much the same in term of facilities! Our room. Same than two years ago! The sink to wash hands, and only access to water, is the blue box you see next to the bikes in the left. The toilet is down the enclosure for the cows, the little grey hut bottom left. Yes the "hole on the ground " stuff! At least this time it was the guesthouse "private toilet"! Two Years ago, we had to use the village's public toilet! You don't want to know! Going at night was funny, as, with the headlamp, I could see the glowing eyes of the cows looking at me! 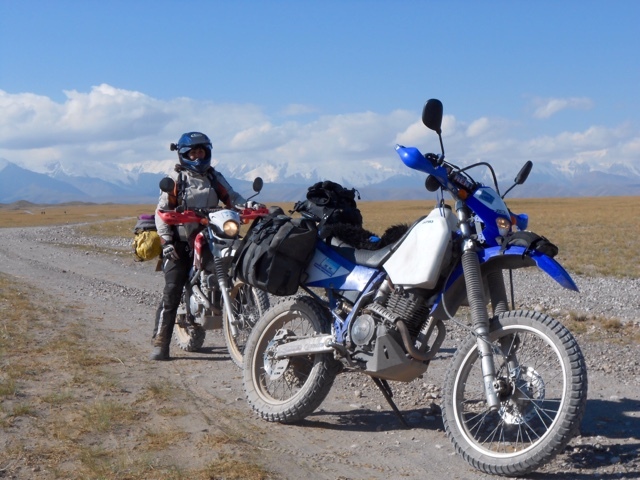 Both bikes had behaved very well at the highest pass of 3600m so we were confident that they would climb to the highest points in the Pamir at over 4600m. After changing out of our motorcycle gear, we went for a walk, in search of a little shop. We found a small cafe instead. 2 cyclists from Poland were having lunch. The cafe only had one portion of Plov left, so we took it and shared between both of us. 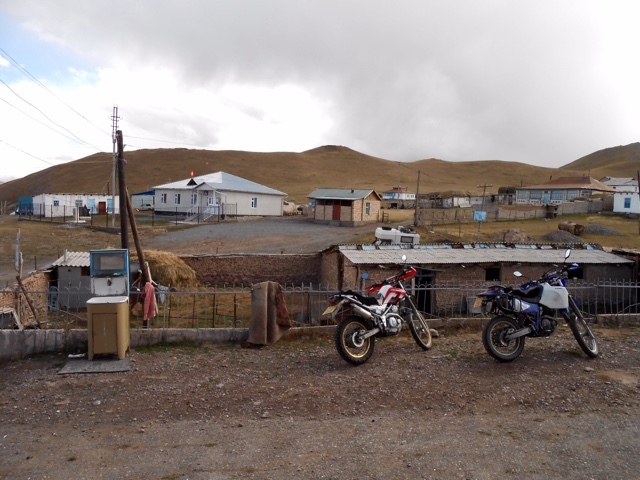 Another couple, cyclists too, arrived and asked the cafe owner if they could change Tajik currency for Kyrgyz Soms. 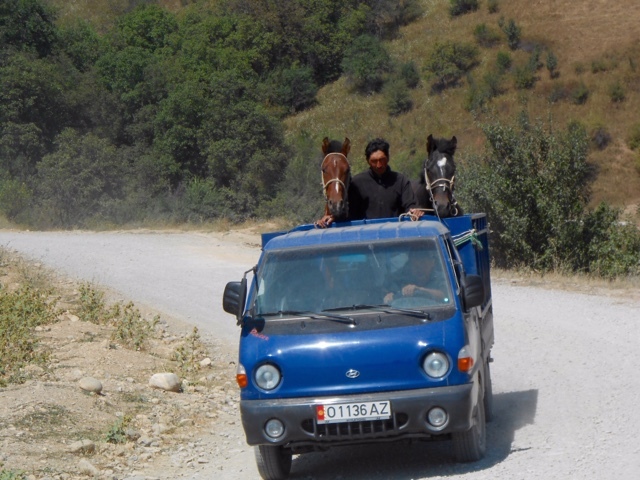 Banks don't change Tajik Somonis. We bought some from them as we would be going that way. 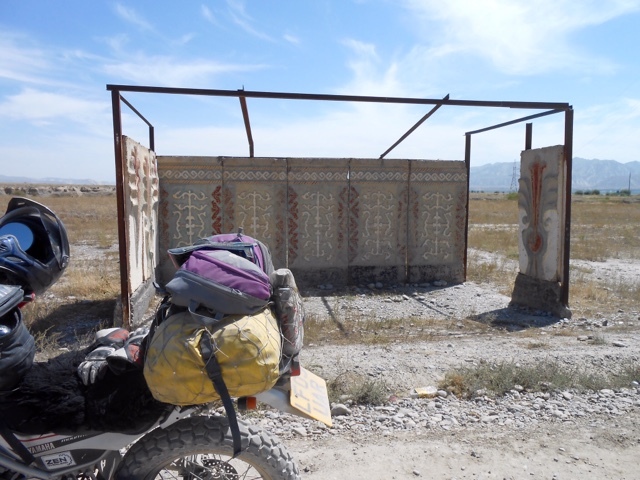 After a chat with all the cyclists we left and finally found a little shop, in the usual shipping container that is used for everything in Kyrgyzstan! The shop was manned by two small kids. It had nothing we could possibly want so we walk next door, I.e. The next shipping container. It was empty but had a couple of things. Probably crisps :D.
A man was outside, I presume it was the owner. He came inside and told us to wait two minutes. He was so drunk he could barely stand and had to lean against the wall, while trying to talk. A kid came ( I presume his son!). After that we went back to the guesthouse. 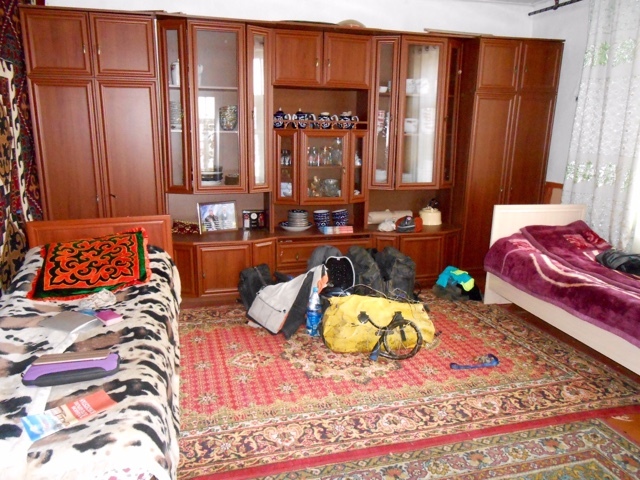 It ended up being a full house with several cars from the Mongol Rally. All had British number plates as it starts in the UK and many buy their car there. One car was driven by two young lads for New York. 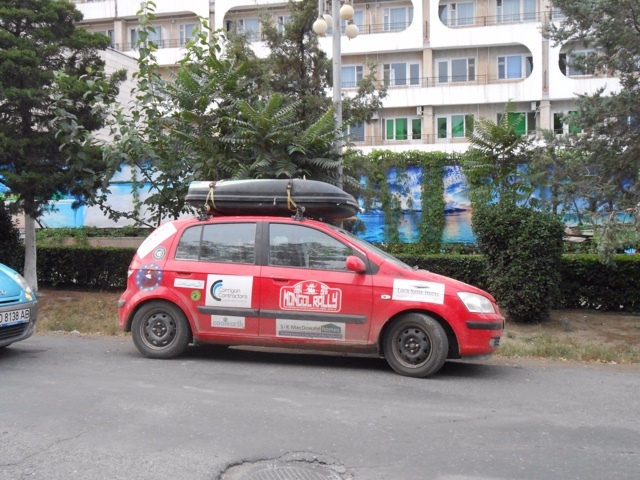 Then a small van and a car arrived, ( also Mongol Rally people!) with 8 people in total, with a variety of nationalities. Dinner was boiled potatoes and buckwheat with a fried egg and bread. We opted out of meat as it is usually rather vile. After that, it was an early night as, with no TV and no Wifi, there was not much to do but read. 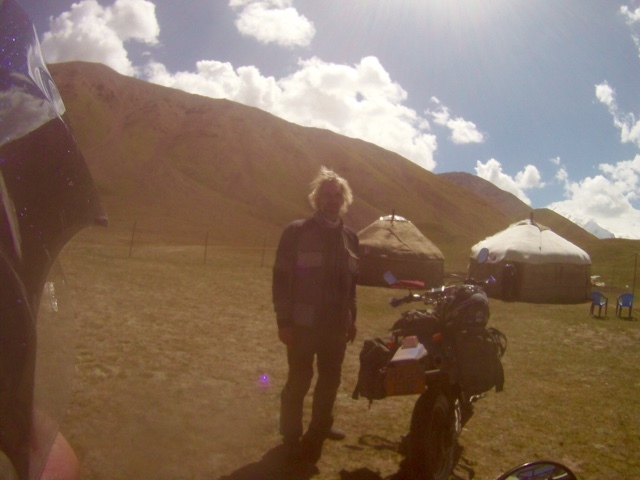 Day 72 - Sunday 21st August - about 60kms - lake Turpal-Kul yurt camp. After breakfast we took our time to pack. We had plenty of time. 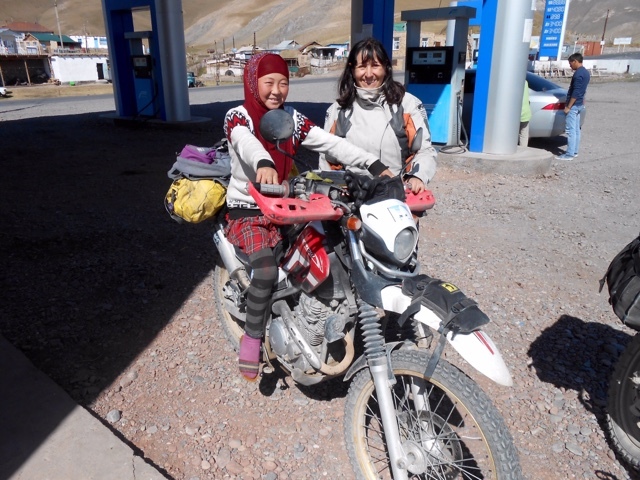 We then rode to the nearbye fuel station to fill up on petrol. The place was run by children, once again! The little girl in charge looked very serious and efficient. 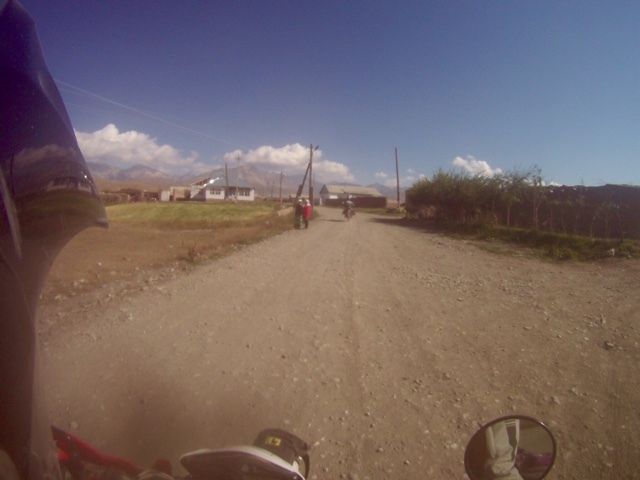 After that we rode to Sary Mogul, further west, passing a police check point that did not bother with us. 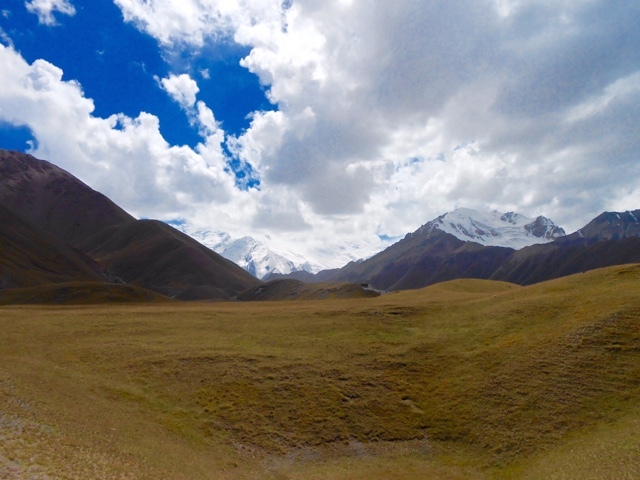 We had in mind to get to Lenin Peak base camp, at a round 3600m, it would be a good place to spend the night and get used to Altitude. 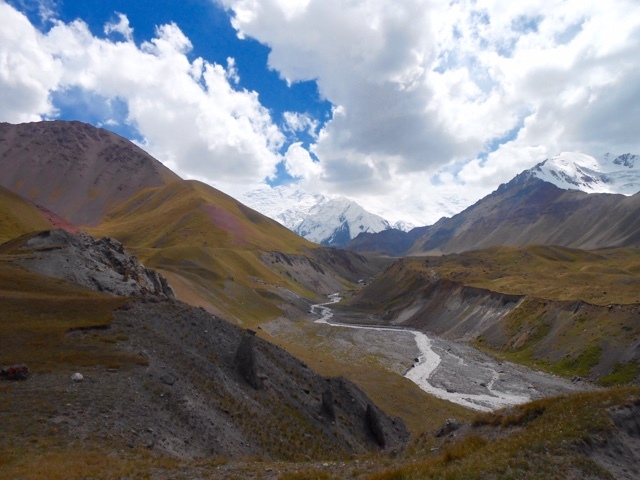 In Sary Mogul, with no idea where to find the trail to the base camp. I spotted a sign for the local CBT ( Community Based Tourism) and found it passed the usually randomly located shipping containers. 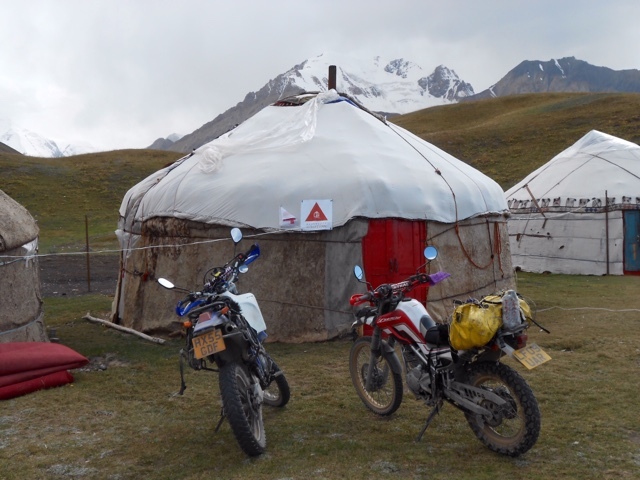 The staff at the CBT office told us it was better for us to go the yurt camp near the lake, as the base camp, which is maintained and built by various climbing companies, would not expect us and have space or food for us! Or so we understood. While stopped in town I got talking with a lad. He was from Israel, and as all the kids over there, travelling after the end of his military service. 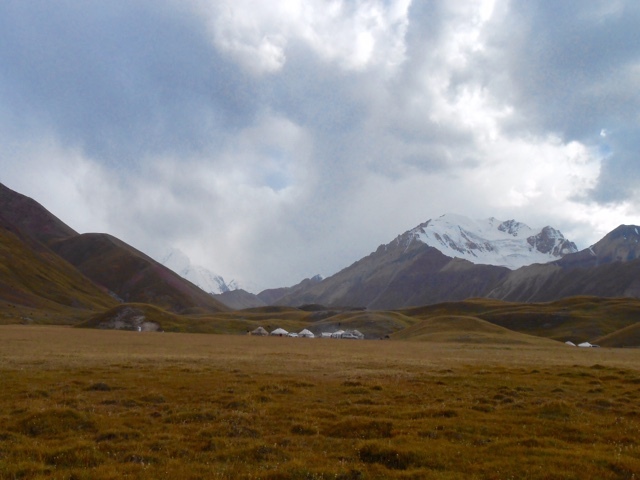 He was planning with his friends to get to the yurt camp, but finding difficult to hitchhike from Sary Mogul. For us it did not matter, they were all in the same direction and higher. 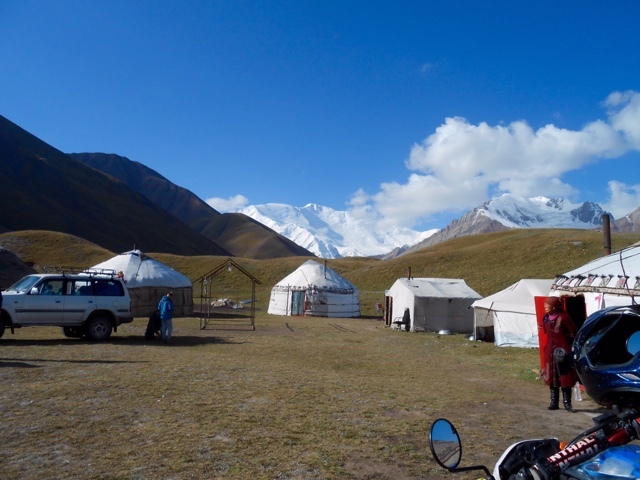 The yurt camp location looked nice in the photos, so we decided to get there. Once given some vague directions, we left. 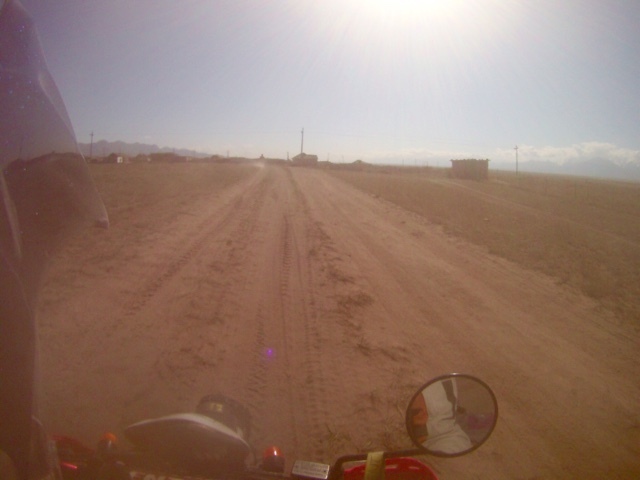 The trail to the camp was sandy and tricky. We finally found the bridge and some random trails. It was not obvious as there were trails and car tracks going to random places. We kept aiming at the mountains. 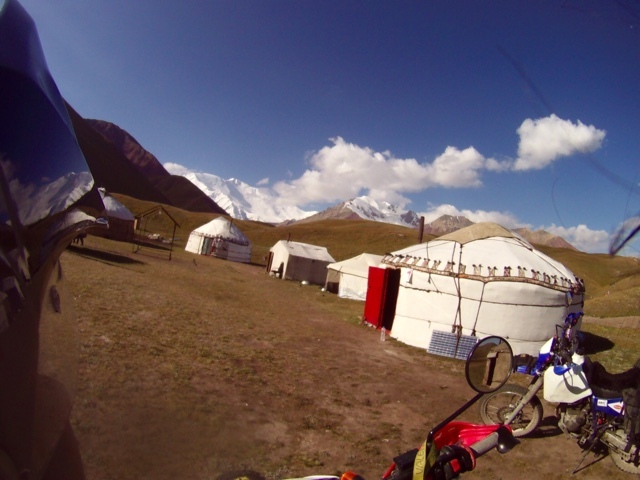 It took us a while but we finally managed to find the yurt camp, 25kms from the village. The place was beautiful, but as night fell, it was bitterly cold. 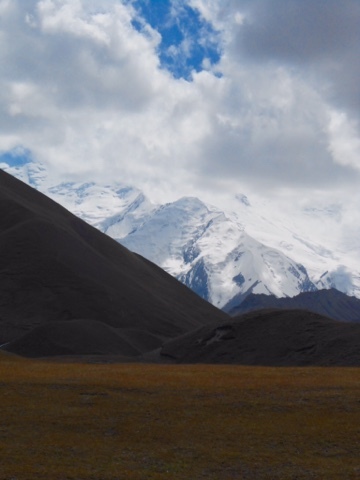 Sadly, Lenin Peak, that is 7200m high, was hidden by clouds! We had a small walk a round. 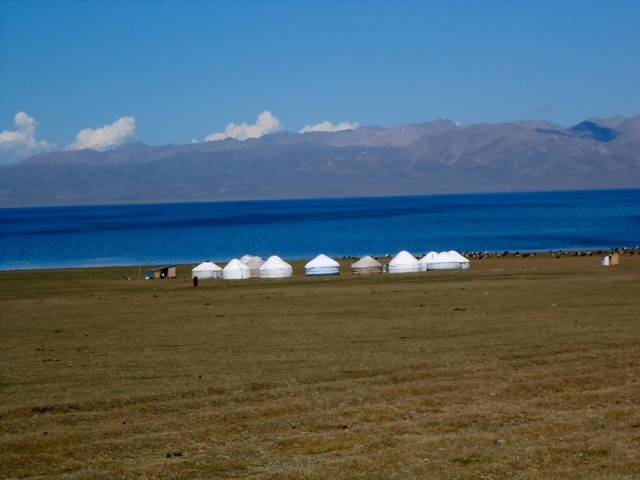 The place was just few yurts and couple of tents. It was a harsh environment. In the camp, we met three Frenchs who left in a taxi that came from the village. There was also a family ( Deutschs?) 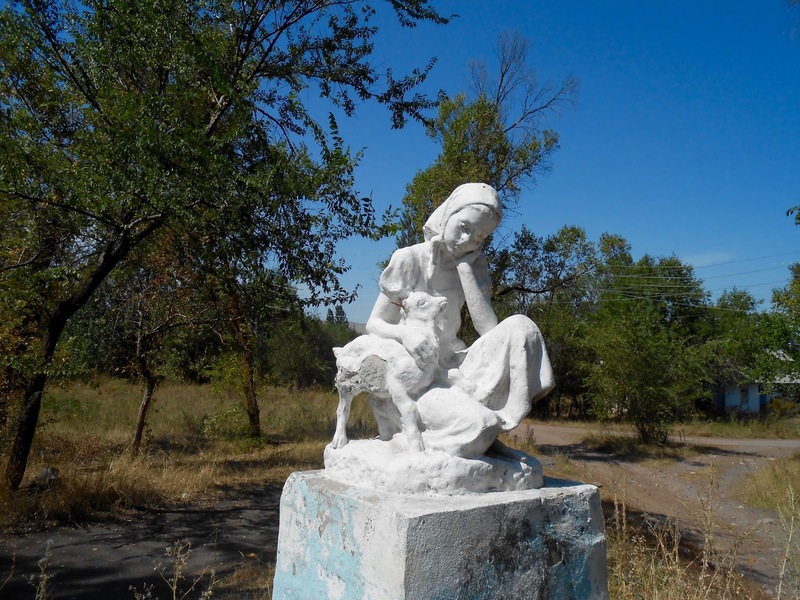 who lived in Dushanbe ( capital of Tajikistan) and a German couple arrived later on as well. We all took refuge in the dining tent, as it had a stove, so it was warm inside. 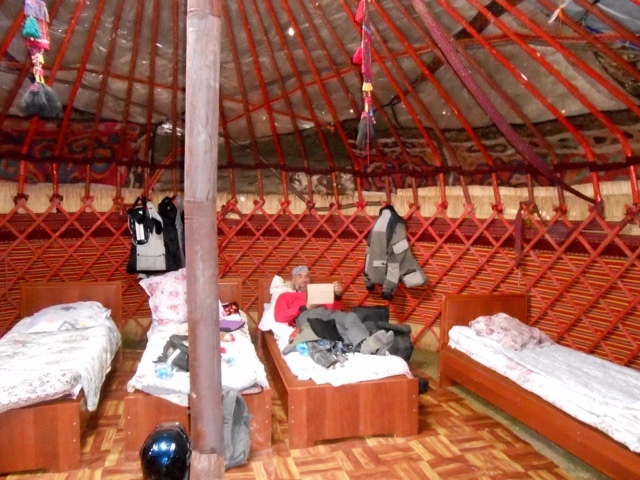 The staff also lit up the yurts' stoves, using the usual dried cow pat as fuel! Dinner was a gruel of potatoes and cabbage, salad and bread! When we asked without meat, they just removed most of it, although we still found lumps of fat in it! It was also decision time. Stress, relief, fear, tears, disappointment.... In the end, for reasons I will not specify here, we decided we had no choice and we had to turn back. 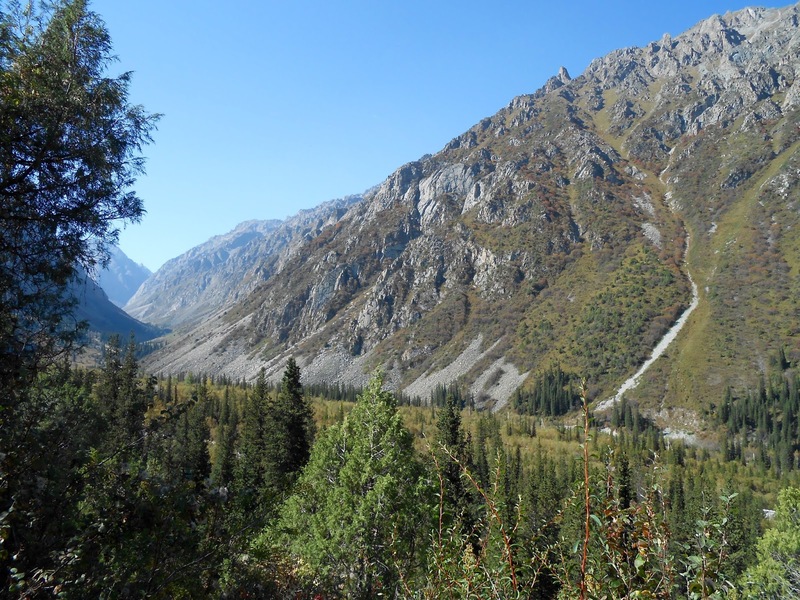 The Pamir would have to wait. We were gutted, but sometimes stuff happens and well... that's life. 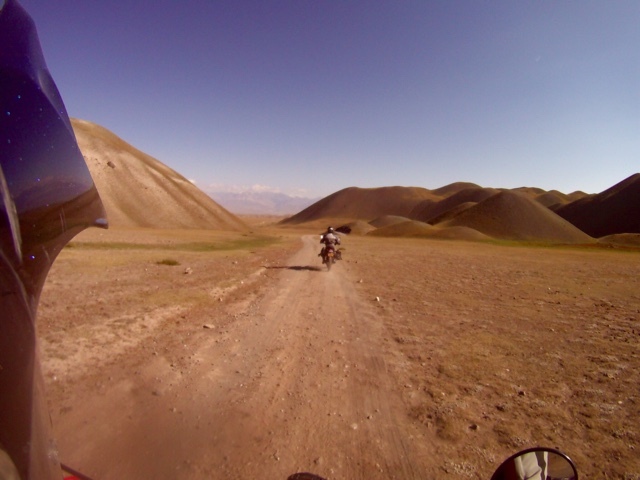 We decided to ride back straight to Osh the next day. 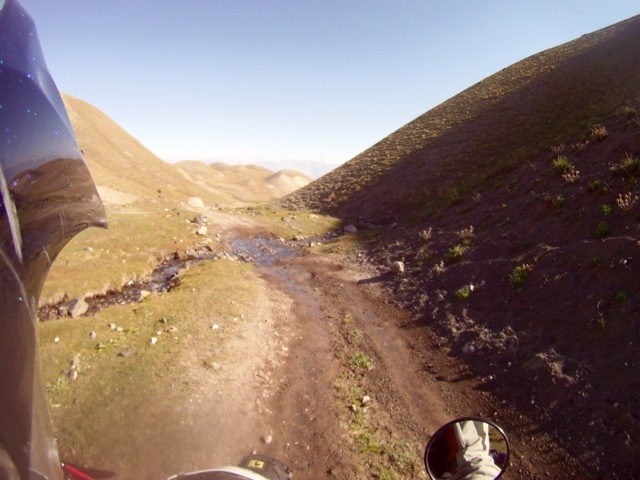 The trail back to Sary Mogul was great fun to ride. 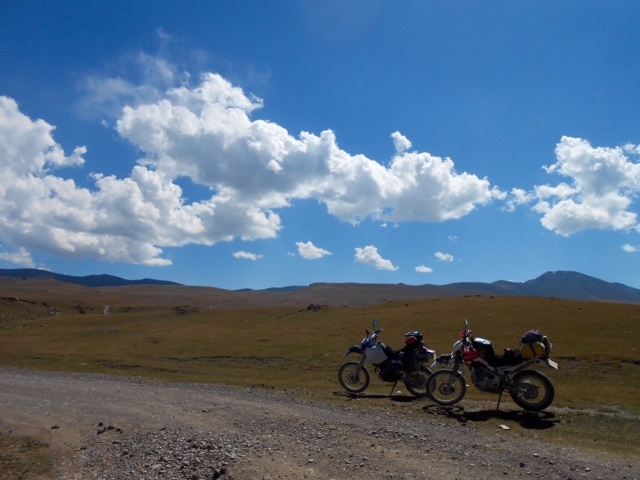 Our bikes, I must say, are perfect for this sort of terrain! 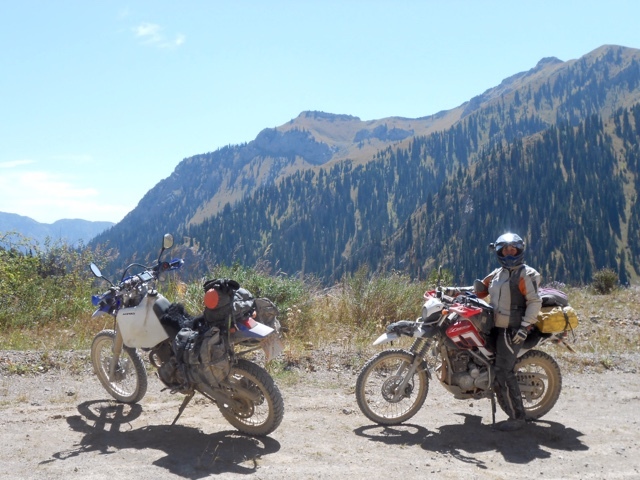 Both of us have decided that our respective choice is the ultimate bike for trips like these! My XT is perfect and I love it. 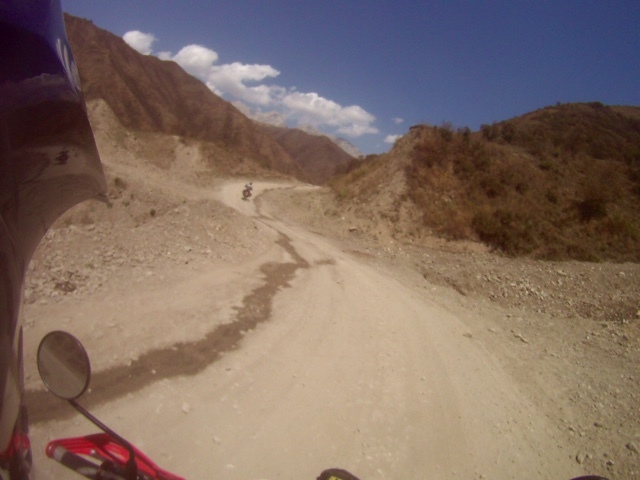 It takes a full new dimension on trails....Throw it through sand, mud, rivers, gravel, any stones, rocks etc... It just goes and I feel so confident riding it that nothing really scare me. Kyrgyzstan is a beautiful country! 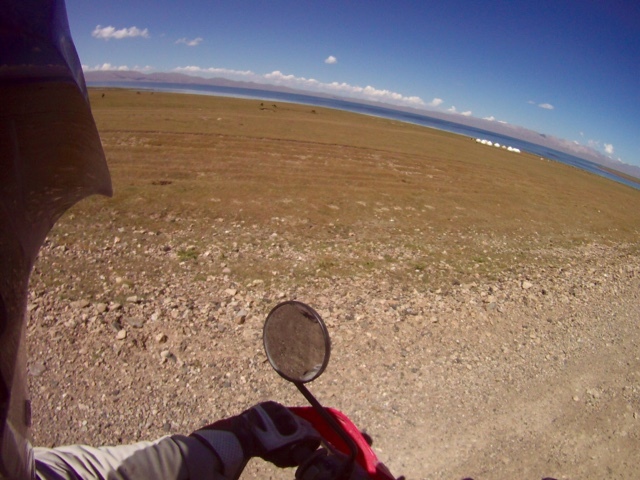 And then my helmet camera ran out of battery! On the trail we came across the Israeli kids. 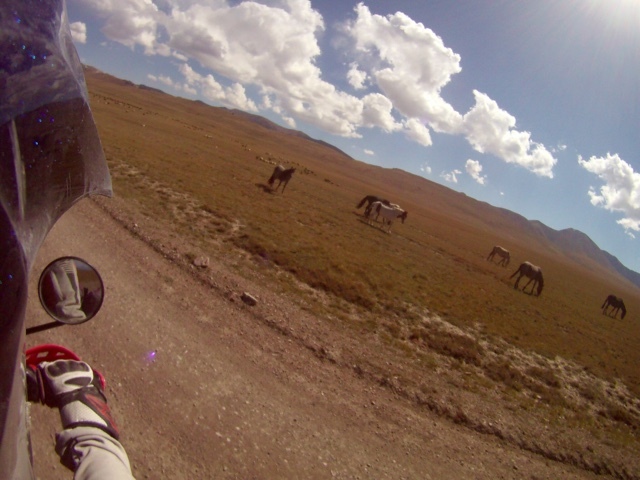 I stopped to give them some tips as it was no obvious to find the yurt camp. They were carrying big bags. I hope they got a lift in the end! It is a long walk. Although, just out of the military, they are probably superfit and I am sure they can make it easily. 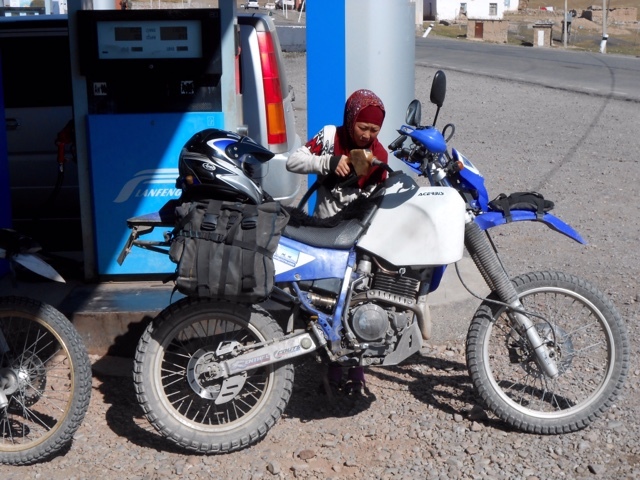 We stopped at Sary Tash to get some more fuel. The same kids were running the place. This time I managed few pictures of Fatima. She was a bright sparkly kid. I felt sorry for her. With good education, given a chance, her life could get so much better. I asked her if she was going to school, she said yes. I hope she won't get married off early and shackled with an army of kids, and what is certainly a very harsh existence in this area. I hope she will be given a chance! We arrived in town by mid afternoon. 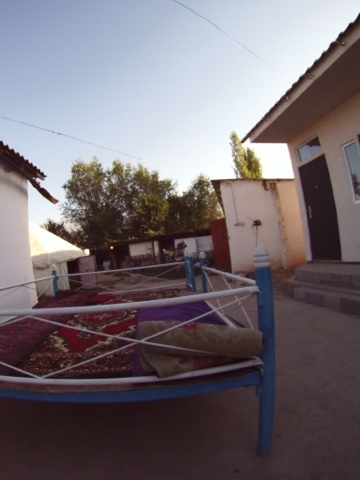 We went straight to the Osh Nuru hotel. We like it there. For dinner we went back to the Aztec restaurant. They had descent food and an English menu. We have done over 14,000 kms. Not bad on our 250cc bikes! After breakfast we walked across the street to the bank, to change back our unnecessary Tajik currency. Banks don't change them. We were advised to go to the bazar and find the money changers there. The Turkish Airline office was also in that direction. We walked first to the Airline office to change the date of our flight. After that we crossed the bridge and found quickly the money changers. 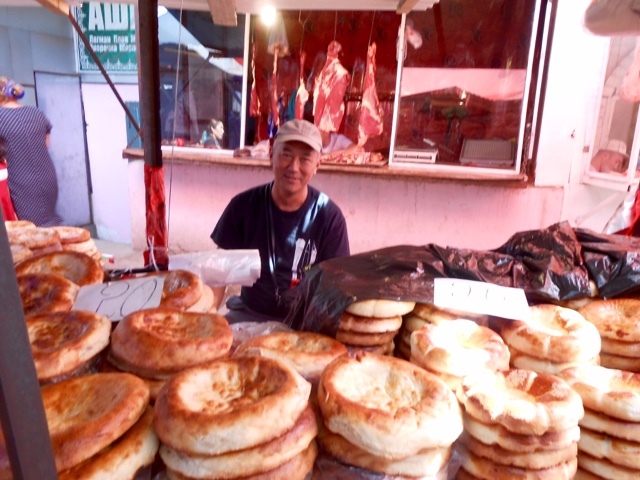 We had a good rate and got Kyrgyz Soms. We then walked across the bazar and bought some bread and cucumber. We still had few tins of Paté. So that would do for lunch. The local bread is very nice. After that we walked back to the hotel and had our lunch and a rest. We decided to ride to Patrick's house the next day. We had left all our camping gear at his house. We had to go to pick it up. I checked my map, looking which trails would be OK to do and where to stay that would not be too high, to spend the night. 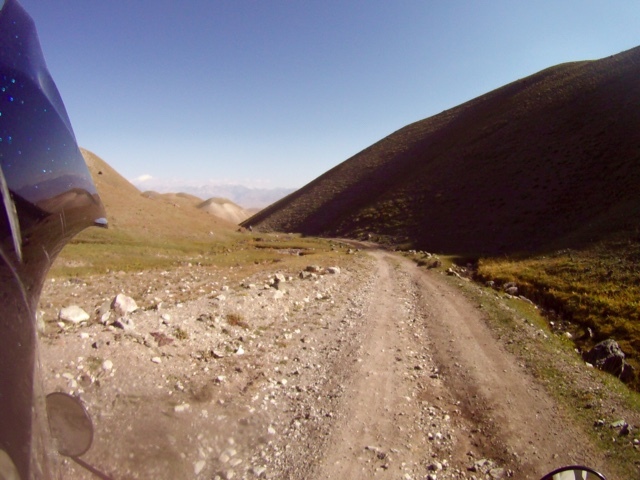 We should be able to ride some beautiful trails and dizzying passes, before we go to Bishkek. We will set off on another adventure this June 2016 until end of September. 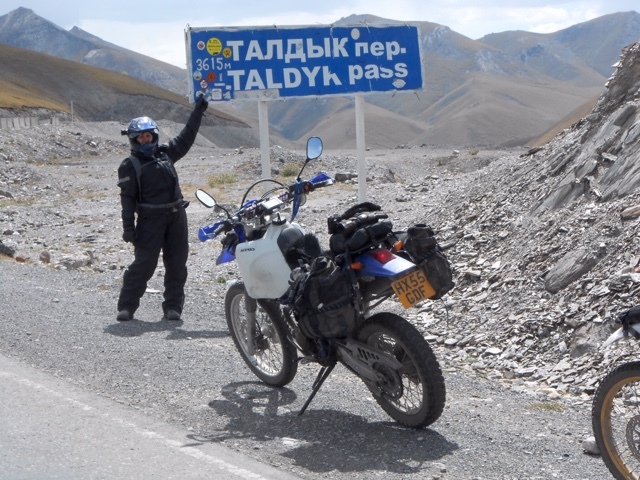 If you want to follow our motorcycle adventures across Europe, Russia and central Asia, subscribe to this blog. I will try to keep you posted as we go along.